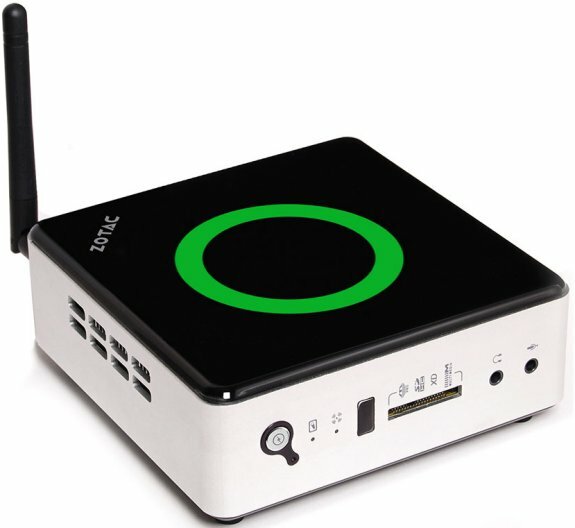 Zotac introduces the ZBOX nano AD10, a new mini PC series with AMD's E-350 APU (1.6GHz, dual-core). The standard version ships without RAM and HDD, while the AD10 Plus comes with 2GB DDR3 and a 320GB 5400RPM HDD. ZOTAC® International, a leading innovator and the world’s largest channel manufacturer of graphics cards, motherboards and mini-PCs, today debuts the palm-sized ZBOX nano AD10 series mini-PCs. The new ZOTAC® ZBOX nano AD10 series shrinks the standard ZBOX form factor and adds more home theatre PC friendly features for your digital media needs. Powered by the AMD “Brazos” E-350 APU Platform with Discrete-Class AMD Radeon™ HD 6310 graphics, the ZOTAC® ZBOX nano AD10 series packs plenty of performance with hardware video decode acceleration technologies for popular high-definition video formats, including Blu-ray and Adobe® Flash®, into a miniature 127mm x 127mm x 45mm form factor that fits in the palm of your hand. It’s time to play with the ZOTAC® ZBOX nano AD10 series.